For example, let’s say you want to talk about attendance. Searching for "attendance" from anywhere within Ed100 turns up Lesson 4.8. 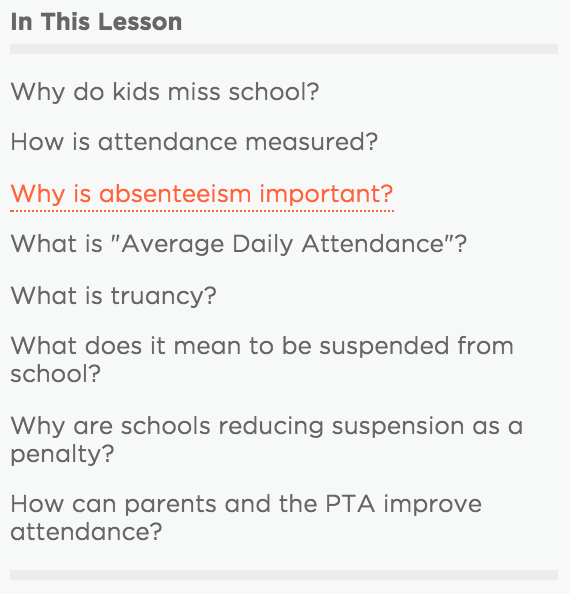 Near the top of each lesson, you'll find an "In this Lesson" box with a list of questions. Click or tap any of those questions and Ed100 takes you straight to the answer. Use Ed100 at Parent Trainings. Our Parent Leader Guides are designed for PTA and parent group trainings. They take about 30 minutes and include lessons, discussion guides, handouts and suggestions for taking action. Take the Full Course. Encourage your parent leaders interested in advocacy to take the full Ed100 course (10 chapters) and share what they learn at your board meetings. Share our Blogs. Copy and resend Ed100 Blog posts out to your school community. Ed100 is on the CAPTA approved content list. A request: Make sure you link back to Ed100, and encourage parents to sign up, OK? Want to win $1,000 for your PTA? Use our twice a year drawing as motivation to get the conversation started. Sometimes volunteers will sign up and try to pass a lesson quiz just to earn a ticket and get a chance to win the $1,000 ... but find that it's so easy to read and interesting that they come back again and again, moving your school up the Ed100 leaderboard in the process! Ok. Just a few more tips. Need Fliers? Visit our public Google Drive where you can download handouts to share about Ed100 in English and Spanish. Share Ed100’s Facebook and Twitter posts and add Ed100 to your web site. We keep our social media up-to-date to help you support your school community. Do you have more ideas on how to use Ed100? Send me a note at Carol@Ed100.org.